The forces of hell have come to Earth. A young soldier (Matthew Kennedy) is seemingly killed trying to avenge his brother’s death by the blood drinking Count Draculon (Adam Brooks). The soldier awakens as a half-man half-machine, Manborg, in a strange cyberpunk future. Soon, he’s captured and forced to fight in an area alongside #1 Man (Ludwig Lee), a martial arts expert, the sharpshooting yet illiterate Justice (Conor Sweeney) and Justice’s knife throwing sister, Mina (Meredith Sweeney). Amidst the mayhem and bloodshed, Manborg struggles to find his identity and struggles even harder to come up with witty one-liners to say when he’s blasting demons with his machine gun hand and elbow rockets. Manborg joins the ranks of films such as House of the Devil (2009), Thankskilling 3 (2012), and V/H/S (2012), that employ an exaggerated 80's/90's VHS aesthetic. It’s a glorious mishmash of green screen work, stop motion animation, and practical make-up. It doesn’t feel far removed from something you would see on MTV’s Liquid Television show of the early 90’s. Layering all these low budget elements on top of one another, it beings to transcend it’s cheapness into a beautifully oddness that I’ve only seen achieved elsewhere in the killer spider film Creepies (2004). It’s a credit to all the actors, that despite playing very broad characters, I still became invested in them and their war on Draculon. I actually found myself worrying if they were going to meet a grizzly end as the film moved toward its climax. Conor Sweeney threatens to steal the show with Justice, a character who is over the top, cocky, and aggressive but his affection for his sister and his trouble reading make him very endearing. Manborg himself is unique in that for an action hero he a) Isn’t really that great at killing bad guys, it mostly seems to happen by accident and b) he can’t come up with a good quip to save his life. He’s like a dull-witted Jack Burton from Big Trouble in Little China (1986). There is plenty of humor in Manborg and wisely it avoids the obvious jokes at the expense of low-budget genre films, instead taking outlandish ideas and characters, and playing it largely as a straight SF/Action hybrid with a dash of horror. It’s a balancing act that the film doesn’t always maintain, but it does so enough to be impressive. There’s a fake trailer at the end of Manborg for a film called Bio Cop that hits all the notes of the [maniac/robo/scanner] cop sub-genre perfectly and then twists them completely out of shape in span of just a few minutes. It’s marvelous in its own right, and I certainly wouldn’t mind seeing it expanded into a feature length film. 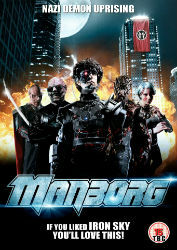 One look at Manborg and you might toss aside as yet another of those ‘deliberately bad’ films that never work, but, it’s actually well-crafted, well written, and exceptionally entertaining.